ACM ROLLING CHASSIS / BIKE KIT. INCLUDES DELUXE ROLLING CHASSIS, ENGINE & TRANSMISSION. We built this kit with three main goals. High quality components, awesome pricing and retro style/modern technology. This is not something we threw together... Ears of building experience, sales & insights bring you the best deal going. These are the same parts that we use on the in-house builds so you know that you are getting the good stuff! We are happy to work with you on putting together your own custom chassis/setup. 100 REVTECH 4X4 NATURAL & CHROME ENGINE. The heart of any bike of course is the engine. In this package we are offering the Revtech 100 4x4 engine in natural finish along with chrome covers. We went with the Revtech 100 4x4 engine for several reasons. For starters these engines are bullet proof! The Generation 3 engine has been out on the market for close to 6 years now with the best track record of any engine we use or service. These are designed for a nice mix of power, reliability and long life. The 4" bore x 4" stroke offers a ton of power but in a smooth curve while not having the downsides of the ultra high compression motors on the market. 2 years / 20 MILES at any local Custom Chrome/Revtech dealer. Forget about having to send back your engine in a crate to get it repaired and see it 7 months later! SPECS FOR 100 INCH 4 X 4 REVTECH ENGINE. Cast from 356-T-6 aluminum with wall thickness optimized for maximum strength. Advanced one-piece casting and machining techniques allow for near perfect case half alignment. Blind case bolts for cleaner appearance. Smooth crankcase deck to cylinder base profile for cleaner appearance. 7/16 inch cylinder studs proven in drag racing applications. Connecting rods and flywheels forged from 4340 chrome moly steel - the strongest material available for those applications. Larger straight 1 1/2 inch pressed in crank pin using RevTech's proprietary extreme-duty military- grade steel. The most advanced oil scavenging system produced yet for air-cooled V-twin applications resulting in better reliability and increased horsepower. 3:1 ratio oil pump drive gears and high volume oil pump enable significantly increased lubrication and cooling. Piston cooling oil jets for better heat dissipation. 4 inch bore with 4 inch stroke for optimum power and reliability. More fin area for increased cooling. Machined fin edges for better appearance. Forged Wossner slipper-skirt pistons with moly coat. John reed design sculpted two-piece rocker boxes. Intake manifold matched to heads for ideal flow efficiency. Low profile air cleaner design for high performance while providing improved rider comfort. Self contained solid state ignition. Please note picture shows Teardrop Cover, the standard round chrome Revtech cover will come with this package. 5 SPEED REVTECH TRANSMISSION POLISHED WITH CHROME COVERS 58305. We went with this after years of trying out different products. Revtech is so confident of the quality that they back it for. Complete your custom-framed scooter with a brand new RevTech® 5-speed transmission. Engineered and manufactured at a state-of-the-art facility to rigid standards and perfectly suited for use as replacements for Original Equipment units or for special construction projects. RevTech - Setting the Performance Standard Often overlooked, your transmission is a tremendously important part of your bike - whether a fire-breathing stroker or a long-distance hauler. It is important enough that Custom Chrome® initiated the single largest development program in the company's history to bring you the beauties on these pages. There are no compromises on materials, no compromises on design, and no compromises in bringing you the finest transmission you can get. Not even Milwaukee can match the quality and strength of RevTech® transmissions. They shift better, last longer and run smoother. RevTech® cases are 356-T6 aluminum cast in permanent molds with all of the finish-machining done on CNC mills. The bearing support plate (trapdoor) is forged, and virtually indestructible. The heart and soul of our transmissions are the famous RevTech® gear sets. Our gears are ground using the latest high-tech machining processes virtually eliminating internal stress in their metal structure. Most other manufacturers use more economical machining that relies on brute force to shape gears, but leaves internal stresses that can cause failure. RevTech® shifting dogs are back-cut to eliminate missed shifts and false neutrals, and as a final step, gear components are computer-matched to provide smooth, vibration-free operation. When it's time to put a bulletproof 5-speed transmission in a Big Twin, there's nothing available that can touch a RevTech® transmission. Gear sets are precision-engineered to provide the strength to handle anything you can throw at them, and feature close-ratio 2.94:1 first gears. The close-ratio sets provide more first gear speed and less gap between first and second. 2.94:1 close-ratio first gears. Assemblies and components are interchangeable with Original Equipment transmissions. Forged aluminum trapdoors for increased strength and durability. Extra material in high-stress areas of the cases. Access hole for electronic speedometer sensor. Back-cut gear dogs for smoother shifting and accurate engagement. 8620H chromemoly steel used for all gears. Gear faces honed and ground and computer-fitted for minimum vibration. Lower case studs already installed. RIGID FRAME / ROLLING CHASSIS PARTS LIST / DESCRIPTION. REVTECH 100 POLISHED & CHROME ENGINE W/ MIKUNI CARB & IGNITION 658532. REVTECH 5-SPEED POLISHED TRANSMISSION 58305. KRAFT TECH 30 DEGREE BOBBER FRAME K16001 MADE IN THE U.
Frame comes RAW (unpainted) and has one of the cleanest welds & quality we have ever seen. This high-quality frame will accommodate any Big Twin engine including strokers, Evolution motors, & Twin Cam 88 using special mountingplate. 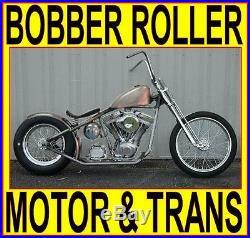 For use with either 4 speed Pan/Shovel style or 5/6 Speed Softail Style. Necks have a stock (30 degree) rake and no stretch in the front down tubes. Comes with mounts that can be grinded off adapted to fit many custom tanks. Accomodates 130-150 size rear tires. CHROME DNA SPRINGER FRONT END - 2 UNDER M-SF-1020N. FRONT DNA AXLE PART# M-AX-1000. FRONT ULTIMA WHEEL W/ 40 SPOKE 21 x 2.15 CHROME SPOKES/HUB/RIM 36-328. REAR ULTIMA WHEEL W/ 40 SPOKE 16 X 3 CHROME SPOKES/HUB/RIM 36-356. AVON RIBBED FRONT TIRE 1659401. 3 CHROME SEAT SPRINGS 42-0033. BLACK SULLY SPRING SEAT SS001B. SPORTY KING GAS TANK 12724. The item "100 MOTOR & TRANSMISSION RIGID BOBBER CHOPPER ROLLING CHASSIS COMPLETE BIKE KIT" is in sale since Friday, October 03, 2014. This item is in the category "eBay Motors\Parts & Accessories\Motorcycle Parts\Body & Frame\Frames".